On the 31st of May, I will be travelling to Colombia to visit Juan Pablo Lasso Argote. I have done projects together with him in the past and he has already visited us in the Netherlands, so it was time to head over there as well. The focus of this visit will not be on sourcing, since I will visit a farm with which I’m already working. However, JP organized a cupping in a coffee shop in Cali where local farmers get to showcase their coffees that we can then examine. 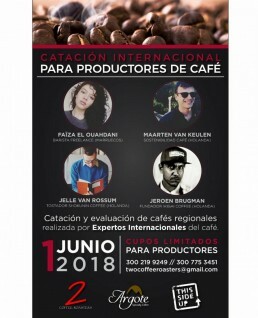 This does allow us to source some highly exclusive coffees, since the farmers are not in the specialty chain yet, but there may be a lot of potential there. They are all very eager to meet us and to see what kind of potential we find. On the Argote farm, I will mainly be working on picking cherries and processing the coffee. This will reinforce my passion and feelings for the product, which I believe to be an important part of the two-way chain. In the meantime, I will also use the results of the fermentation experiment we did last season to produce something totally new. Juan Pablo already showed me that he’s currently drying his first natural coffee ever. This is something I wanted to do as well, though it does mean we can take it a step further. Two weeks ago, I finally tasted a very hyped coffee roasted by Ben Richardson, owner of Many of Many Coffee: the Cecilia Cangrejo. This coffee tasted like super sweet and creamy mango, one of the causes being a special processing technique. After picking, Cecilia fermented the coffee within the cherries for 26 hours, and only after that was it depulped and washed. This gave more of the pungent natural sweetness, but none of the earthy downsides of natural processing. Using the results of my experiment with Juan Pablo, I now want to see what happens when we use the same technique, but with a 30 hour fermentation time, which seemed to be the most pleasing. 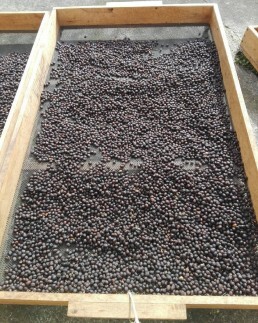 JP’s coffee cherries are likely to produce more sugars than Cecilia’s, so I think slightly more fermentation should be possible without any downsides. This, we can then compare to a regular natural of his, and his washed coffee which we might also ferment for 30 hours. To summarize, there’s exciting times ahead! In order to get everyone in the mood, this website’s theme will now be changed to Argote red.